I think by now most users are aware that Twitter is taking every URL in every tweet and converting it into a t.co link. It’s not hard to imagine how this is a win for Twitter (they get to capture tons of data), and on the surface it seems like it could be a usability win for users as well (the fact that a URL of any length now only counts as 20 characters in a tweet is very useful). Unfortunately the way it’s been implemented by Twitter leaves a lot to be desired, and in general is a net loss in usability for users. 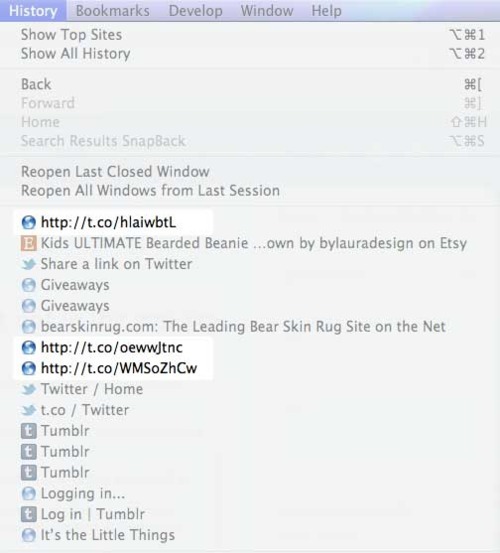 The actual URLs are often obscured so you can’t see the address of site you’ll be taken to if you click it. Even if Twitter makes the URL visible, it truncates it and strips the “http://,” which renders the text unidentifiable as a link once it’s taken out of the context of Twitter (or even if it’s simply copied and pasted into a new tweet). It feels creepy that Twitter feels the need to control their environment this way. Ok, that third one isn’t a usability issue, but for me it matters. I think less highly of Twitter and the product and their brand because of how intrusive the t.co experience is. Those t.co links should not be there. The way Twitter has implemented their redirection (from the t.co URL to the target URL) somehow prevents the target link from showing up in Webkit’s browser history, and this breaks my browser history. There are pages of content that I have visited, and would often like to search for again, that simply don’t show up. Twitter is breaking a crucial feature of my browser. If it were possible to opt out of Twitter’s URL shortener none of these issues would be a problem, but you can’t, so they are.